If you are looking for a day trip or have a little longer and would like to stay somewhere away from Chennai then I can help. 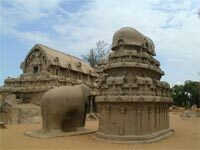 Many of my customers have enjoyed days trips to the Fishermans Cove resort about 1 hour 15 minutes from the Taj Hotel, this can also be combined with a visit to the temples at Mamallapuram which is about 45 minutes further down the road. It may seem a long way in a TukTuk but there is nothing better than crusing down the open roads out of town with the warm breeze on your face. Or what about a visit to the Enfield Motorbike Factory?